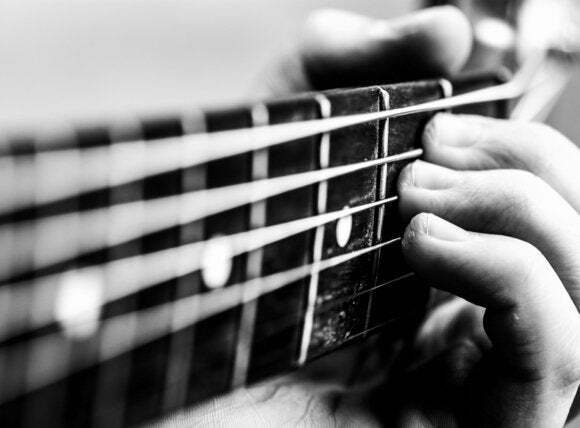 If you play guitar or another string instrument, one of the thankless tasks you do before you play—and in between songs—is getting your instrument in tune. There are several ways you can do this: You can have another instrument—preferably one that doesn't go out of tune—play a note, and then tune your other strings to that one. You can use a tuning fork for one string, and tune the rest of your strings to that. Or you can buy an electronic tuner that you clip on your guitar. But if you have an iPhone or iPad, why not use an app? 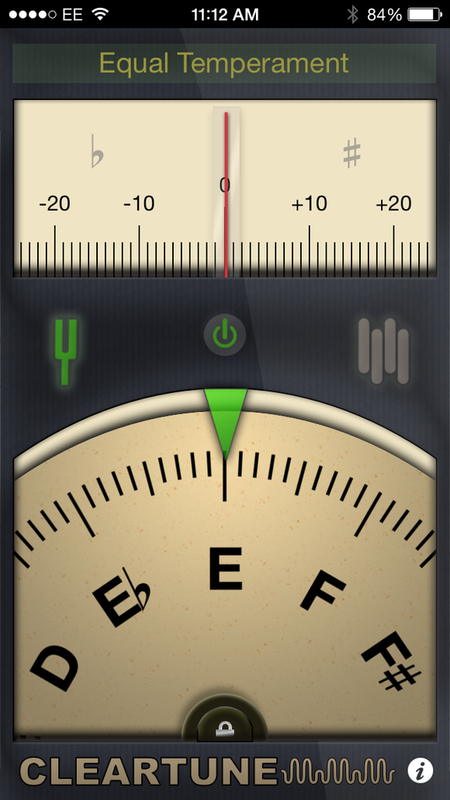 There are lots of apps that can help you tune your guitar, or other instruments; here are five of them. Besides the tuner, Guitar Toolkit comes with a metronome, chords, and scales. Guitar Toolkit ($10) is much more than just a tuning app. It's also got a metronome, a library of 2 million chords, and more than 900 scales with millions of positions. Plus, an optional in-app purchase lets you create chord sheets, use an advanced metronome, and more. For tuning, Guitar Toolkit is very flexible: You set your preferred pitch between 392Hz to 528Hz, and you can even use presets to tune any plucked string instrument. There are dozens of alternate tunings, and you could use it with, say, a violin or cello by setting up a custom tuning. I find Guitar Toolkit's shaky needle a bit disturbing: It wavers as it's detecting the pitch, and even when I played a tuning fork, it didn't stay immobile. But its flexibility and many additional features make it a great app for anyone who plays guitar. 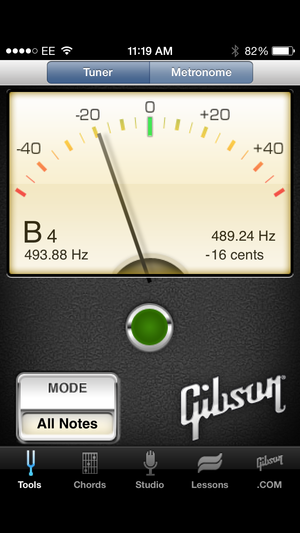 Gibson's free tuning app shows the precise frequency of the note you've played. Gibson Learn & Master with StudioShare (free) offers a similar display: A needle that wavers back and forth as you zero in on the right tuning. It wiggles less, and I find it easier to use than Guitar Toolkit. It also displays the precise frequency of the note you've played, and the number of cents you are away from the target. It's got some additional features as well, including some alternate tunings, a metronome, and a simple chord library. 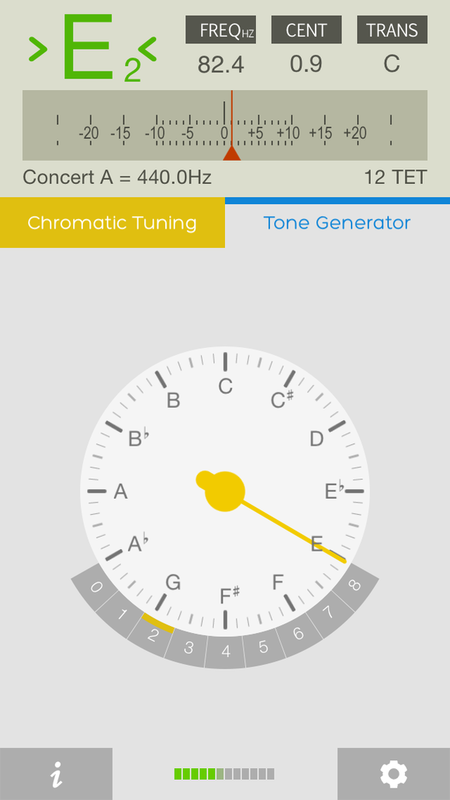 But if you just want a free, easy-to-use tuner, this might be exactly what you need. 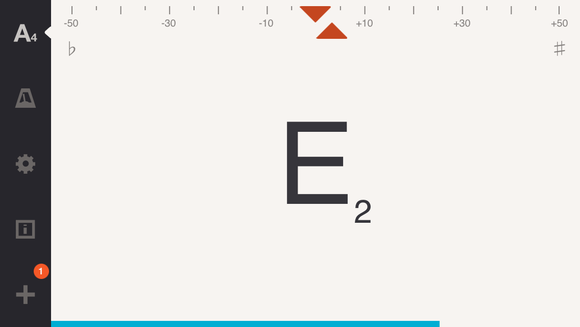 Cleartune ($4) is a chromatic tuner that lets you set the desired pitch, choose from a number of temperaments, and use a variety of different types of notation (standard notes, solfège, etc.). It displays a horizontal scale that moves beneath a cursor, as well as a note wheel, and I find it quite easy to use. Cleartune boasts of a lot of cool features, but I often couldn't get a clear response. You can optionally display frequencies, and in pitch pipe mode, it can play tones at various frequencies for you to tune to. However, I question its accuracy; when I play an A-440 tuning fork, the app finds it hard to settle on what frequency it is, and bounces around a lot. Cadenza ($1) has a different type of display. Instead of a needle, it has two triangles that align when you're at the right frequency. It doesn't display much else, though, other than a simple scale of the number of cents that you're flat or sharp. The bottom triangle moves around a bit, even when I play a tuning fork, and there's no sort of indication, other than the alignment, that you've reached the correct frequency. You can adjust the pitch from 410Hz to 450Hz, which is, perhaps, limited if you want to use this for an instrument playing baroque music, which could be at 392Hz. But it also has a metronome, solfège notation, and an in-app purchase lets you upgrade to features such as a sequencer, pitch pipe and more. Don't let Cadenza's minimalist design fool you. insTuner has a lite and a pro version, but the extra features on the pro make it worth the $4. The $4 insTuner—Chromatic Tuner with Tone Generator (or its free Lite version) has a slick interface, and gives feedback with a needle in a circular dial. It's a chromatic tuner, and can tune to any note, but the pro version also has a strobe tuner, a spectrum analyzer, and more. Its display shows the frequencies of your notes and how many cents you are from the target, and the color of the note changes from red to yellow to green as you approach the correct frequency. It also has a tone generator, and you can change the pitch to any frequency. In addition, it works with bowed instruments, and offers a couple dozen temperaments, such as Meantone, Werkmeister, and others. It is by far the most complete tuner app I looked at. Depending on your usage, some of the features may be overkill, but if you know what they mean, then you may need them. I like Guitar Tuna's electrocardiogram feel. Finally, Guitar Tuna (free) takes a different approach from the other apps I looked it. Its display looks a bit like an electrocardiogram, and it shows the variations in pitch on a sliding "piece of paper." When you get the note right, it pings, and a button flashes for that string. At first, I found the display annoying, but it's actually easier to use than many of the other apps. If you only need to tune a guitar, the free version will do the trick, but in-app purchases let you unlock access to other instruments. 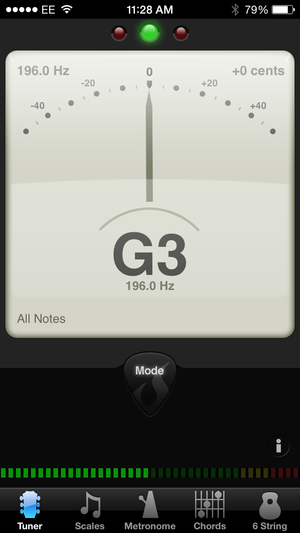 As you can see, there are guitar tuner apps for everyone. Depending on your needs, you may be happy with a limited, free app, or you may want to get one of the more powerful tools. It's good to know how to tune from one note—and then tune your other strings to it—but it's a lot quicker to tune with an app.